I know the exact day on which I met Richard and Carrie Levin. All I need do is check the Tour booklet for the Highlands 2014 Home Tour. It was May 3rd. I was showing the house at 40 French Creek which I had just completed. They came in and told me that they had an Eichler in Sunnyvale and asked would I be willing to travel that far for a project. I told them that for me it always depends upon the project and the clients. It was the beginning of one of the most enjoyable projects in my career, a very close working relationship between the three of us, and a deep friendship which continues to this day. Richard and Carrie had owned the house over 20 years. They’d raised their two sons there and were happy with the neighborhood. However, they had wanted to make changes to the house for some time. A couple of early bad experiences with contractors on smaller projects made them a bit hesitant about getting involved in a remodeling project again so they had put it off for some years. When we met, they had lived in the house long enough to have pretty clear ideas of what needed to be changed. Once we started to work on the design I found that they were flexible and adventurous. Two very good traits in design clients. We started with the idea of covering the atrium to bring that space into the center of the house and make it more than just a passage. I initially drew it as a single pitch, Eichler style roof with about 60% of the walls above the roof level in glass. Carrie had asked about a possible butterfly roof, so I also did a version of that for the first conceptual presentation. At that meeting it was clear that what Carrie wanted was the Butterfly. Richard was also on board. Since I had never built one I was excited about the potential from a design standpoint. My original Butterfly design was still only about 70% glass. One of Carrie’s first comments was that she wanted more glass. Even a glance at my website will show that I will act upon, or create, any excuse to build with as much glass as I am able to put into a design. So, my next iteration of the concept was about 99% glass. Pretty much as you see it now. The final outcome stayed true to the initial concept renderings. One of the initial renderings presented to the clients to help them visualize the butterfly roof addition. The next step was to get a structural design which would allow us to put that amount of glass into a “floating” roof and still have shear compliance. Fortunately I had just built French Creek, where the office has a floating roof with 99% glass surround. Flat though. A very simple roof. Although we had quite a time getting that concept past the San Mateo County Building Dept plan checker, we were able to get approval in the end and the final construction of the design was a complete success. Once again I used the services of my long time friend and structural engineer, Martina Treister. Martina’s dedication to the work along with my right hand man, Ken Rolan’s understanding of the needs of the structure allowed us to create a design which gave Carrie and Richard the Butterfly they wanted. I have to give credit to the Sunnyvale Planning/Building Dept. I prepared an illustrated brochure explaining the design concept and my Eichler background in an attempt to sell the proposed project. Sunnyvale has what I consider to be the clearest, most thought out design guidelines for the remodeling of Eichler homes I have seen anywhere. 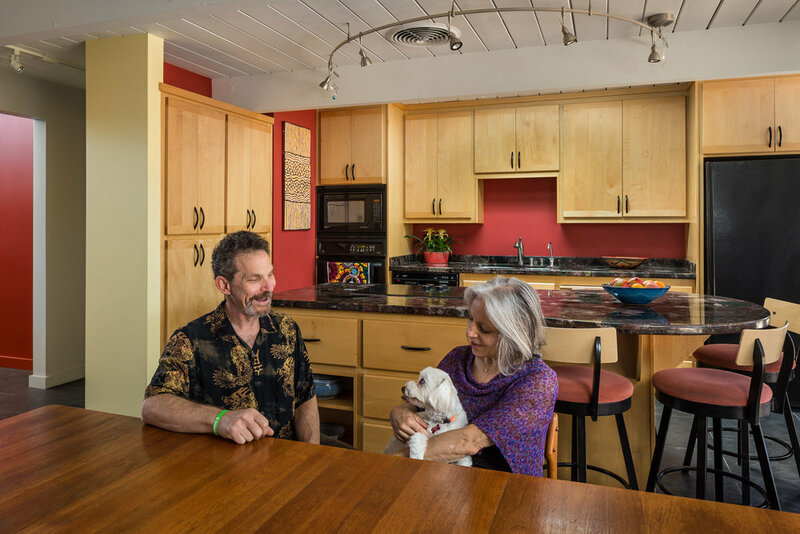 Most departments attempt to apply the standard general design guidelines in place for all other styles of homes to Eichlers and Eichler style homes. This is often a bad fit. Sunnyvale has put time, thought and effort into creating a real Eichler targeted set of guidelines. 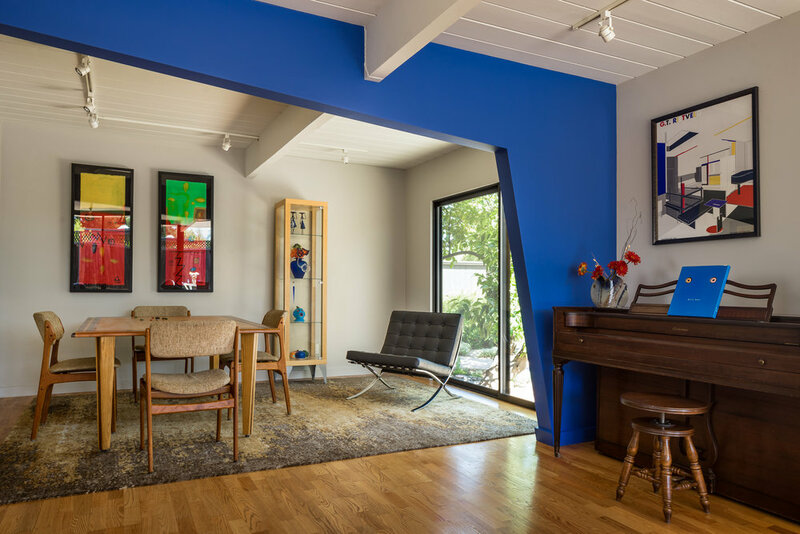 I read through their complete program, although, as a long time Eichler resident and experienced designer/builder of Eichler remodels, most of what I read I was already aware of. Still, it gave me a clear understanding of what I needed to consider in my design, and what I pointed out in my application brochure. 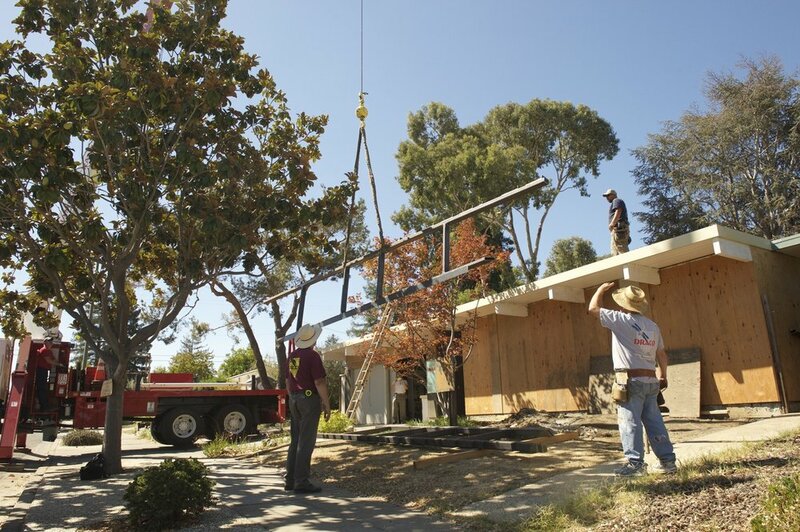 I was greatly relieved when the response of the Planning Dept was overwhelming approval and appreciation for the concept and the care which we had used in the application of new concepts and materials within the Eichler aesthetic. I was getting pats on the back from Planning and the process was quick and painless. Getting through the Building plan checking was somewhat more of a task. There was a lack of understanding about what we planned to do with the Butterfly roof. At a quick glance, from a structural standpoint, it does seem inexplicable. I designed it to appear as if it were floating and that is how it appears. To such an extent that I was witness to several phone calls between my engineer, Martina, and the structural plan checker as they discussed the steel frame, the HardyFrames standing on their massive concrete piers, wind loading and uplift factors, etc. In the end we were required to construct the roof and its’ support structure as if we were planning to land helicopters on it. Still, we were given a permit. My goal, from a purely aesthetic perspective, was to have the roof itself appear to float above the house as if it were more of a sculptural element than a roof. It is intended to be seen as almost separate from but linked to the house by design, proportion, purpose. I wanted to paint the house dark, in this case Dragon’s Breath by Benj. Moore, so that it became a solid base, or plinth, and that the viewer’s eye is drawn upward to the lift of the wing which is the roof. That is why my original 3D CAD renderings show the roof as all white. 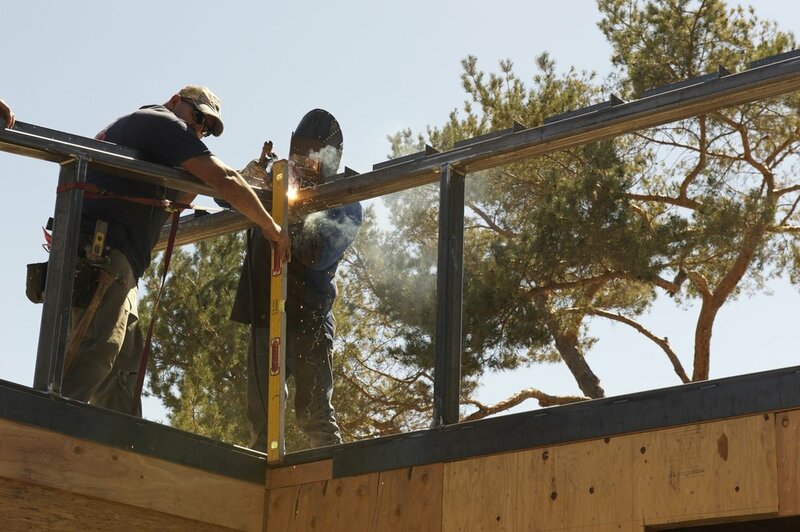 The decision to use clear redwood as the ceiling surface came late in the project, when the roof was already built and we were able to see it in place. Richard and Carrie wanted to have the natural wood ceiling as a break from all of the painted surfaces. I agreed and gave up on the all white wing. I’m glad that I did. Teamwork. I usually think of my designs as subtle. I’m not certain that I accomplished that with this one. I have no regrets. Every time I go there I stand across the street and just look at it. People driving down the street stop and look at it. 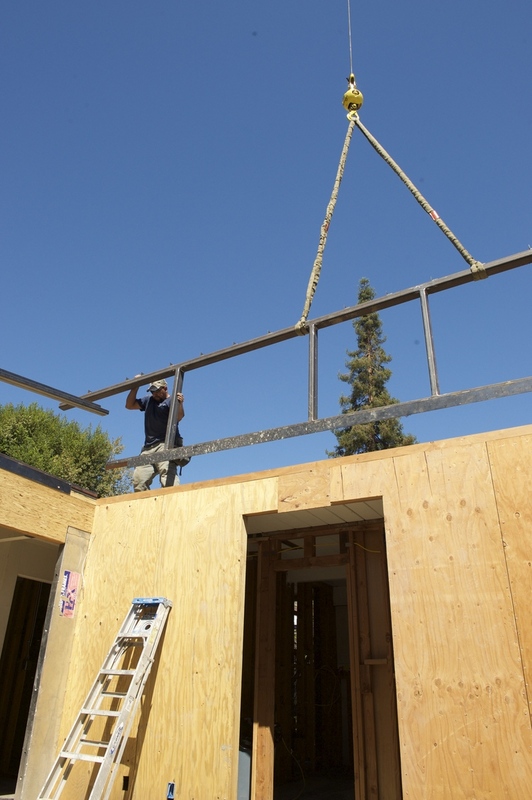 The roof itself is held by a steel framework to the beams surrounding the atrium perimeter. The steel work was done, as it always is, by Ed and Gerard Shuba of Custom Metal. They had done the frame work for the French Creek office floating roof among other projects so they knew what I wanted. This one however is a complex double pitch roof. The two long sides are different lengths from center so the pitch alters. Then the whole roof is also pitched to the rear. It was very interesting in frame. Very sculptural. Ken developed a 3D CAD rendering of the entire structure for welders and carpenters to work from. 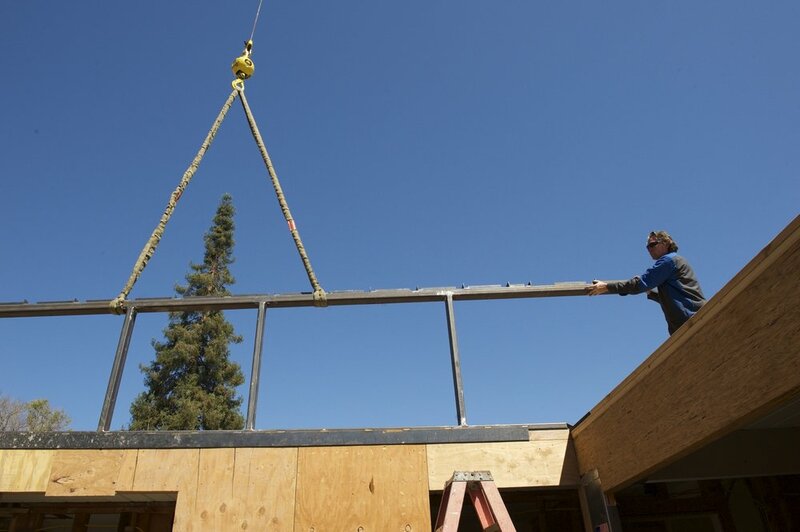 The day that the steel was craned up onto the roof and the four sides welded together was an exciting, and very hot, day. We had the crane, two welders and my full crew, as well as Richard and Carrie. I asked Margo to be there so she could photograph the hoisting of those big pieces of steel frame. Then level them up, square it and weld the corners. Get it right the first time because it is way too much trouble to do it twice. There are 4 Hardy Frames in the corners which tie the steel perimeter frame to the large concrete piers under the corners of the atrium. Those piers beneath them and the perimeter footing surrounding the atrium occupied the first several weeks of work on the project. In this project I felt that for the most part things could stay as Anshen and Allen had designed them. The E 11 (in this case a 1959 variant of the basic E 11 plan known as the “E 41”.) 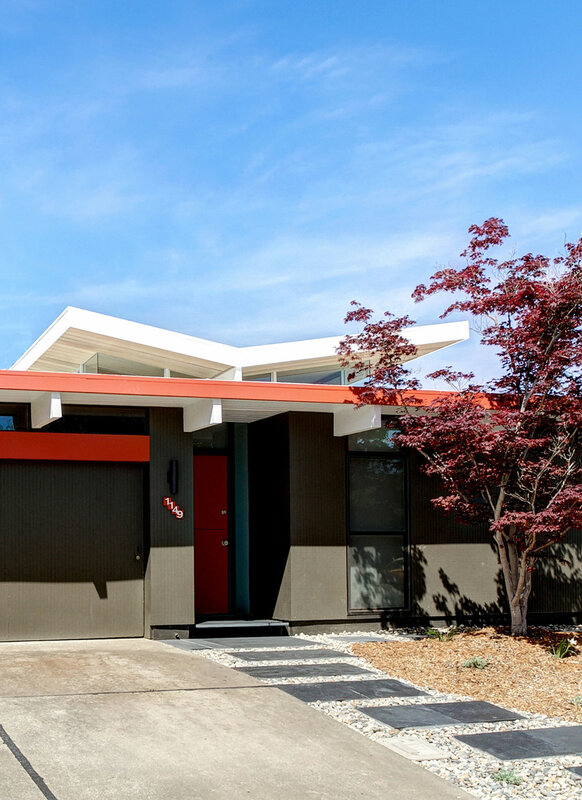 is a rather undistinguished design for an Eichler. The street facade is very subtle, and due to the fact that there are several of this model along that street, it can tend to disappear. Richard and Carrie were interested in having a more individual and noticeable street facade. There are many E11’s ( or variant’s thereof) in that neighborhood and some other Atrium models as well. Just a slow cruise through those streets will show you many different ways to cover the atrium. Most of them are best described as “unfortunate”. Some, such as the one on Sage Court, are well designed and executed. That house was one of the driving factors in our design. The street view of it is elegant and interesting. Richard and Carrie liked it a lot and wanted me to see it. I’ve never been inside it but I love the exterior effect. Very interesting, well balanced, proportional. It evokes the sense of comfort and relaxation which I get from viewing a good piece of architecture. We all agreed that there were lessons there which could be applied to 1149 Tangerine. The Butterfly is the star of the show, but we also re-created the rest of the house. We changed the living area floors to a 2’ square black slate. This gives the interiors a visual anchor which allows for the open, pavilion effect of the glazing and the flow from room to room. It also links the “public” areas; entry, atrium, dining, kitchen. Other areas are defined by the use of the hardwood flooring. I used glass block to allow light from the atrium to penetrate the bedroom hallway. It also makes a very nice relief from the solid walls of the atrium space and at night, with lights on in the hallway, it acts as a night light, giving a soft glow to the atrium space. "Most people, upon walking through the entry and into the atrium, stop, lift their gaze, and smile." The bold red wall accentuates the atrium's floating roof. The use of strong primary colors is balanced out by neutral grays, and the natural wood ceiling. The play on primary colors was not my original intent. I knew from the outset that I wanted the long wall in the atrium to be a strong accent. Whether this was to be accomplished by paneling it with wood or stone, or by painting it I was not certain of until I could see it in place. The red was chosen at a design meeting at my office with Carrie, myself, my CAD gal Tereza, and Maggi Goodman, my design associate. One of us suggested that wall in red. Tereza put it on the screen. I was immediately smitten with it. It was a part of the design concept up until it was time to paint it. Then, Carrie got a little hesitant about it. I had to campaign for it a bit. I think that now everyone agrees. Once we had that we were looking for our color scheme. The idea of putting “Norma” Blue on the office wall came next. I wanted it on the longest wall in there and also because that wall isn’t “in your face” it becomes a bit subtle. You sort of have to look for it. Painting the final wall yellow seemed completely logical to me. Given the sense of openness in the spaces I don’t feel that the strong colors feel overwhelming. My play on the "sloped" dividing wall, which has a large beam running across it through that form, was a tribute to Sandy Calder. Painted in "Norma Blue". The sculptural wall between the living room and the annex was a funny misunderstanding. Carrie told me that she wanted a “sloped” wall. I have a wall in the entry of my home which is sloped from ceiling to floor. I thought that was what she meant. So, I did a CAD image of that in the annex on the two walls, and painted it “Norma Blue” to match the office. It looked pretty good, but it wasn’t at all what Carrie wanted. When she told me, and showed me a photo, I understood. My play on the dividing wall, which has a large beam running across it through that form, was a tribute to Sandy Calder. We didn’t do much in the kitchen. It had been remodeled by Richard and Carrie themselves recently and didn’t really need a complete upgrade. However since we were redoing all of the plumbing and electrical we did open the back wall of the living room and redo them in the kitchen. We added a vent as there was no hood or vent. We changed the lighting systems. Because we had most of the roof stripped off we went ahead and ran new fresh supply lines for water to bathrooms, laundry, kitchen. We were moving the main electrical panel due to the push out of the masterbedroom so we also ran two new subpanels. One is in the utility room to supply laundry, kitchen, and other spaces on that side of the house. The other is directly to the garage to supply power for two electric car chargers. While we were engaged in running pipe around the roof we added two gray water systems. One picks up the waste water from master sink and shower along with both sinks and the shower in the 2nd bath. That is all run to a box buried outside of those baths which can be set to run the filtered water to plantings or straight out to the sewer line. In the laundry there is a simple 3 way valve which directs the laundry water out to the garden or to the sewer. We also have a rain water collection system. This catches all of the water from the butterfly roof and runs it to a bank of rain barrels along the masterbedroom wall. From there it can be directed to the garden. 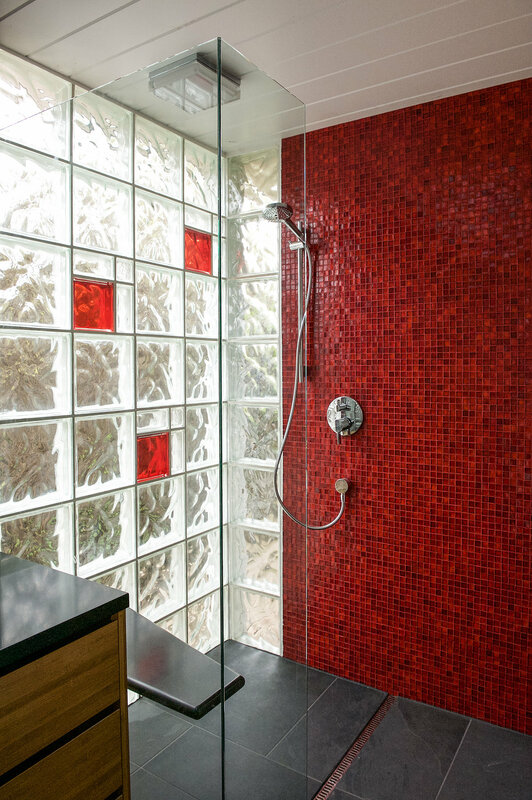 The bold red is also carried through in the master bathroom. Both bathrooms were completely remodeled. The masterbath was enlarged, with the vanity and shower placed into the extension. The glass block is a standard Draco design element. The gorgeous red tile was all Carrie. She chased the tile and then the custom epoxy grout to match it. Although we did enlarge the masterbath and the bedroom slightly our goal was not to make the house a lot bigger. We all agreed that there was really enough space available but that it wasn’t arranged properly. By making the atrium truly a part of the interior living space it became the core of the house. A place to watch the clouds and birds, listen to music and read, or just sit and chat. The integration between that space and the adjacent office, dining room and kitchen makes it work as a family gathering space. Having the living room close but separate gives the ability for someone to opt out of the activities and read, or watch TV. Without any significant addition of square footage the house now “lives” much bigger. Tom Kundig says, “Detail is important because it’s at that level that you interact directly with the building. You touch, move, and handle detail at the most intimate levels. I think that if you can’t walk into a house and smile about something, there’s something missing in that house.” I agree with that statement fully. Particularly the idea that a house should make you smile. My experience with Tangerine, and this is validated by Richard and Carrie, is that most people, upon walking through the entry and into the atrium, stop, lift their gaze, and smile. I consider the project a success. The Levins are very happy in it. I hope that you find aspects of it which cause you to smile.